We do not have a lawn. Even the grass is in short supply and each year “the green bit” is invaded by the most successful weed. This year the prize goes to varieties in the family of the Compositae, probably Cat’s Ears and Hawkbits but my Botany skills cannot identify it or them any further. Never the less when it comes time to mow the stuff we feel obliged to leave some patches uncut. 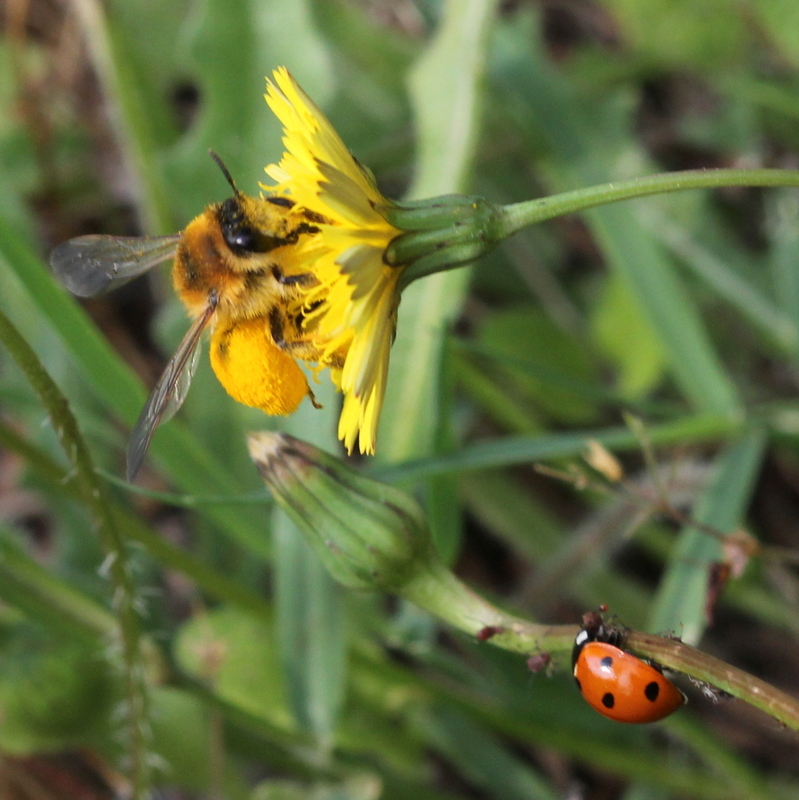 What used to be an annoying, unsightly weed has become the preferred pollen source of the Dasypoda hirtipes that are living in the garden just now. We can see them foraging from a distance as each time they land on a flower head it dips and the whole mass of flowers undulates as the bees move from flower to flower. The video gives a very short clip (12 seconds) of the action. 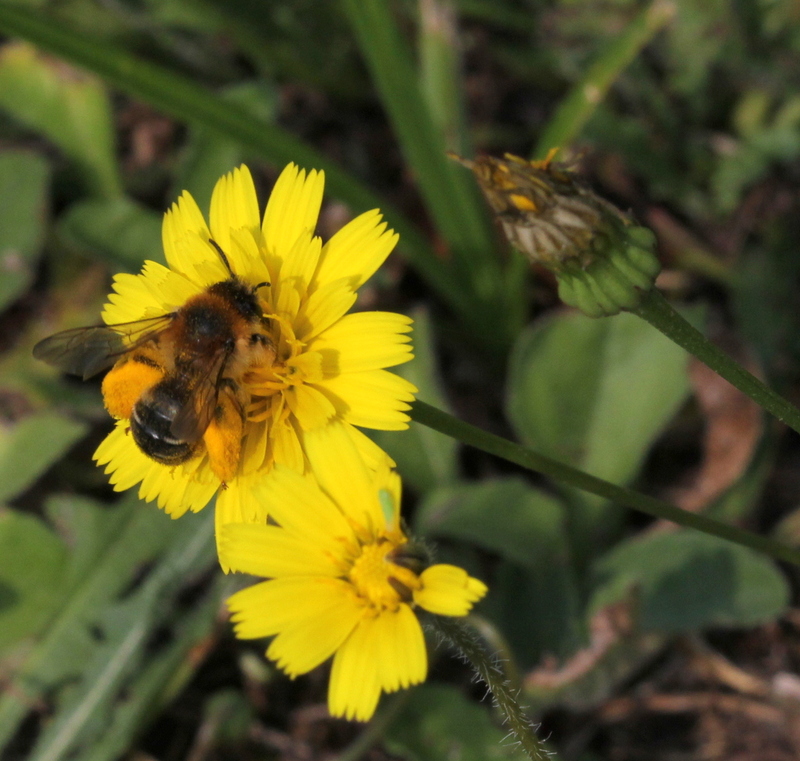 The French name for this bee is “Abeille à culottes”, for an obvious reason. I don’t think it has a common English name as it is not quite as common as it is here in France. She collects pollen on long hairs on her back legs but sometimes she has a pollen frenzy and it goes everywhere! This solitary nest is just at the edge of the back garden very conveniently located for access to the flowers. 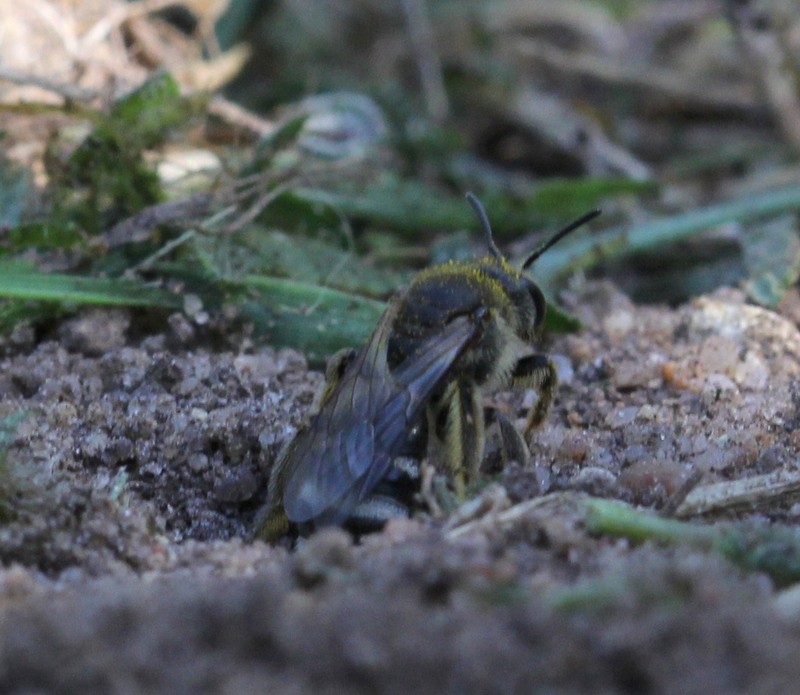 She comes out of the hole very cautiously so I have managed to get some shots. She zooms back in as the open nest is quite exposed so my best photograph to date is a yellow smudge at the nest entrance. It is nice to think she is leaving me the eggs and I’m sure our weeds will be back to feed her offspring. 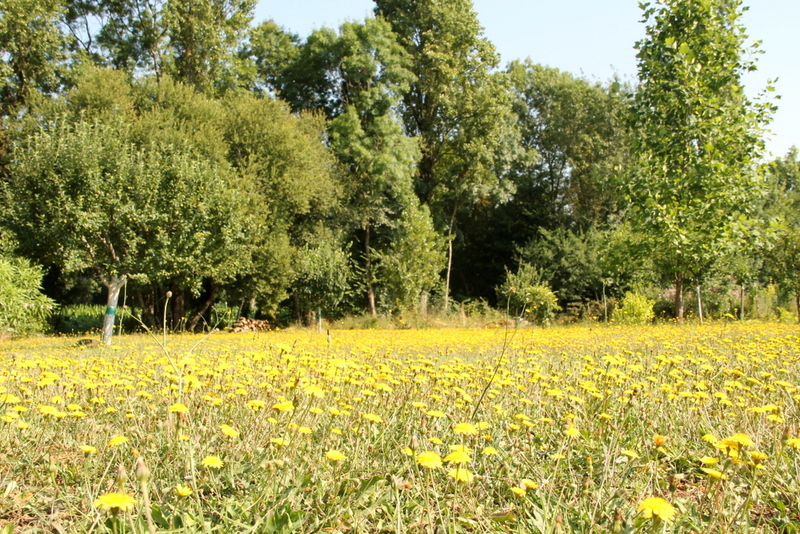 Categories: Bees | Tags: bees, French life, garden, gardening, nature, solitary bees | Permalink. Amelia that shot of the pollen-covered culotte-wearing bee is astonishing! Thank you, they are very photogenic. Don’t think I’ve ever seen such stuffed pollen baskets! What a beauty. She is one of my favourite bees. Nice of you to leave her some food . . . and nice video as well. FYI, you can easily embed it in the post – Add Media/Insert From Url, add the direct link to the video. Don’t copy the one from the browser’s address bar; click on “share” and grab that link. Thanks, I copied the link. I’ll try the share next time. Blimey that is one loaded bee! The French name is perfect! It is a wonder she can fly with that load but I can attest that she does so – and rapidly. What a fabulous creature – I want one. That portrait shot is absolutely amazing – she is being a very obliging model. You must have them, just look in the dandelions when it is sunny. Lovely photos. I like watching the bees swinging from one plantain flower to the next in our “lawn”. The bees are a great reason to leave the meadow uncut until fall. 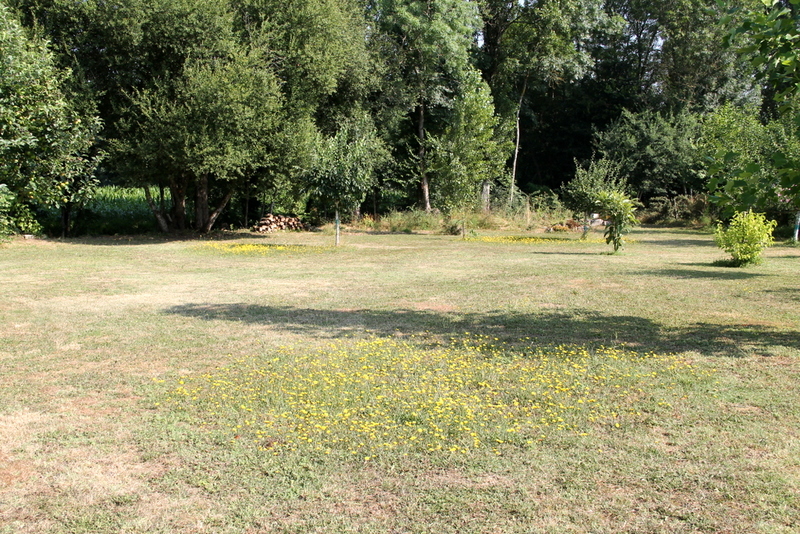 Its not exactly a meadow, it’s the only lawn we have. I would like to try to keep a piece as meadow without it impinging on us getting from A to B in wet weather and fitting in with the rest of the garden. 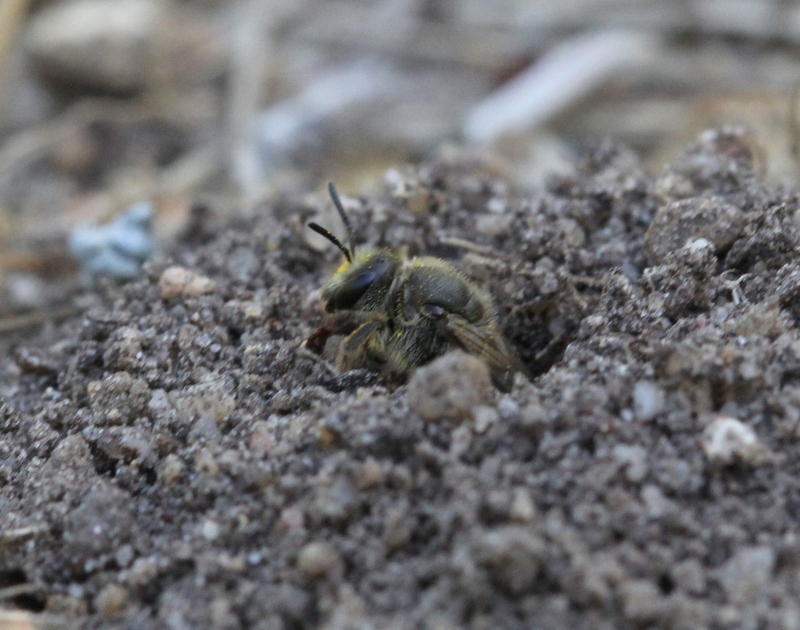 Thanks, I’m not into sterile lawns and in consequence I’ve been watching 3 other different species of mining bees make there homes in it earlier in the year. They are the ones I’ve noticed. What a friendly looking bee, and one that looks very satisfied with herself! I’m glad you think she looks friendly. 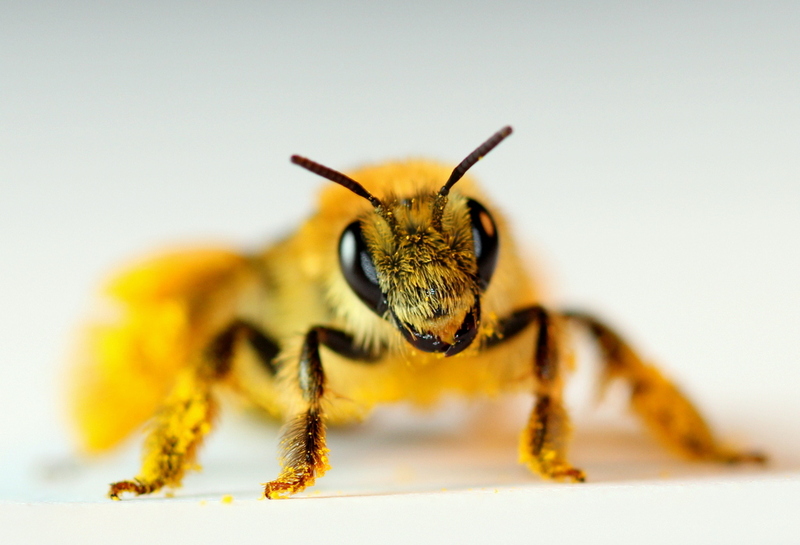 I think all the bees look cute. I have taken photographs of some with green eyes that I think are so beautiful but my son-in-law says they look wicked. I think he has watched too many Star Wars movies. Hahaha, now I can comfort myself with your words when I wooryy about my green weeds. Loooooove the bee portrait, it is very good! Thanks, I love my bees.